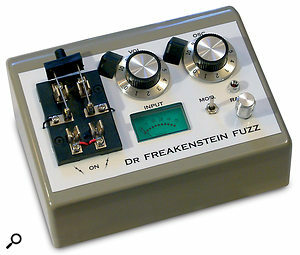 The Dr Freakenstein Fuzz reminds me of the kind of thing I used to experiment with back in the mid '60s, when fuzz was a new effect and its workings were something of a secret. I spent many evenings, having blown my pocket money on germanium transistors, trying to capture that elusive sound — but I never came up with a housing as wacky as this one (although I did use coffee tins at one point! ), which is more reminiscent of an electric-chair controller from some sick doll-house! 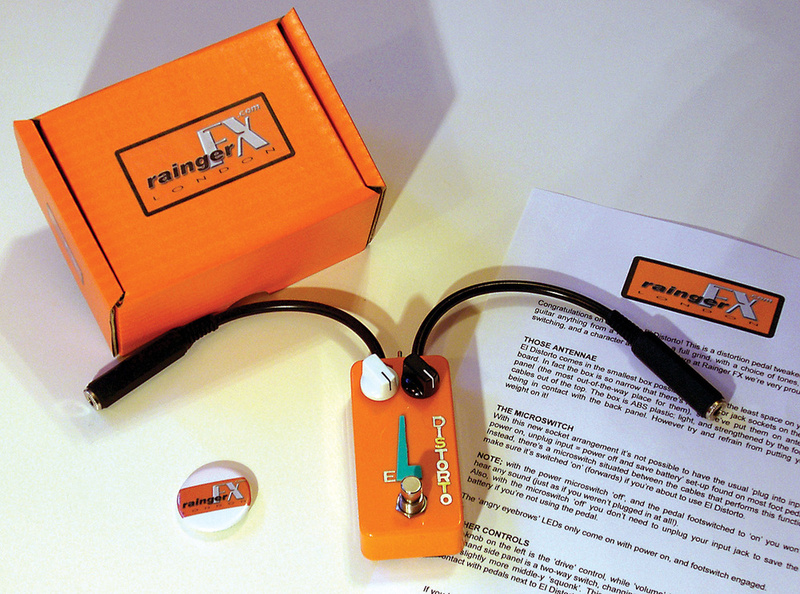 The Rainger FX Freakenstein Fuzz.Housed in a plastic case, with the audio inputs and outputs, plus a pair of footswitch mini-jacks, on the rear panel, the Freakenstein Fuzz works using oscillator sync, with one of two on-board oscillators being reset by the incoming audio waveform. The frequency of the oscillator being reset can be adjusted using the Osc control knob, which has a nice little LED light shining on it, as does the Vol knob. Adjusting the oscillator knob alters the harmonic content of the resulting waveform. A small, green meter follows the input level, but the weirdest part of the whole deal is a Dr Frankenstein-style lever switch in place of the usual footswitch: this box is not intended to go on the floor. A Mode switch activates an LFO control, driven by a third oscillator, which essentially modulates what the Osc knob would normally control, and there's an LED that flashes at the LFO rate. The foot controller (called 'Igor') is basically a pressure sensor, trapped in a folded metal hinge, and covered with a rubber sleeve. Again, this stirs up memories, as my first attempt at a pedal used a piece of carbon-soaked foam between two metal plates (I couldn't find a place to buy the gearing needed to work a conventional pot). This reduced in resistance when compressed and so made a passable pressure sensor. You can use Igor connected to either of the rear-panel mini-jacks to control either the Osc function (instead of using the knob) or the modulation range. You may question the ergonomics of this postage-stamp sized pedal, but it actually works pretty well. The tiny El Distorto has its jack sockets on flying leads.I found the basic fuzz sound from this unit to be aggressively spitty, just like some of the early '60s pedals, and when the oscillator is modulated, you get a very synth-like tonal sweep, with overtones of oscillator sync. I particularly liked controlling this element from the pressure pedal. If you're a tone hound looking for a classic guitar tone, you won't find it here — but you will find a wealth of nasty, squealing, snarling tones that may set you thinking in different directions (the pub, in my case!). I did, however, find that the normal tone of the guitar was dulled somewhat in the bypass position. What do I really think? Dr Freakenstein's Fuzz is, frankly, barking mad, and the product of a seriously disturbed mind... but in an era of musical conformity and 'me too' products, that has to be applauded as a refreshing change. Just don't blame me if you look out of the window and see peasants with blazing torches and pitchforks when you play it too loud! These two effects boxes offer a range of tones, from the traditional fuzz of the El Distorto to the more neighbour-scaring sonic manglings of the Dr Freakenstein Fuzz. Music Ground +44 (0)20 7836 5354.